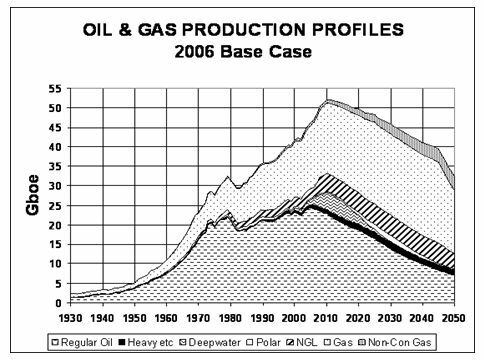 I do not propose here to provide more than a bare-bones explanation of Peak Oil (detailed information can be accessed by way of the footnotes). Suffice it to say that while there is some dispute among experts as to when it will occur, there is none as to whether. The global peak is merely the cumulative result of production peaks in individual oilfields and in whole oil-producing nations, and these mini-peaks are occurring at an increasing rate. The US also serves as a laboratory for evaluating the prospects for delaying the global peak. After 1970, exploration efforts succeeded in identifying two enormous new American oil provinces—the North Slope of Alaska and the Gulf of Mexico. During this period, other kinds of liquid fuels (such as ethanol and gas condensates) began to supplement crude. Also, improvements in oil recovery technology helped to increase the proportion of the oil in existing fields able to be extracted, in some cases doubling it. These are precisely the strategies (exploration, substitution, and technological improvements) that the oil producers are relying on to delay the global production peak. In the US, each of these strategies made a difference—but not enough to reverse, for more than a year or two now and then, the overall 37-year trend of declining production. To assume that the results for the world as a whole will be much different is at best unwise. How near is the global peak? Today the majority of oil-producing nations are seeing reduced output: in 2006, BP’s Statistical Review of World Energy reported declines in 27 of the 51 producing nations listed. In some instances, these declines will be temporary and are occurring because of lack of investment in production technology or domestic political problems. But in most instances the decline results from factors of geology: while older oil fields continue to yield crude, beyond a certain point it becomes impossible to maintain maximum flow rates by any available means. And so as years go by there are fewer nations in the category of oil exporters and more nations in the category of oil importers. 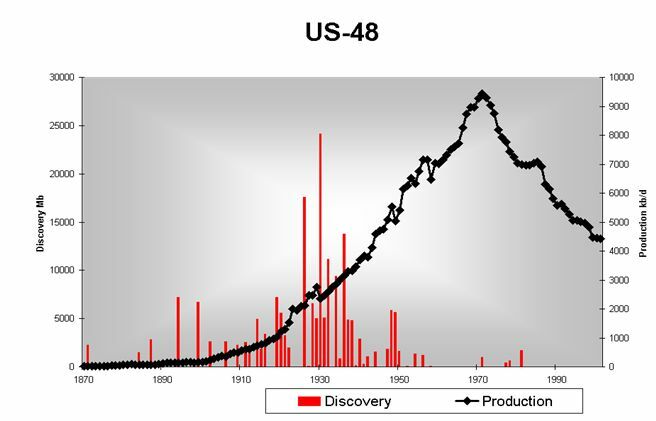 Meanwhile global rates of discovery of new oilfields have been declining since 1964. Clearly the timing of the global peak is crucial. If it were to happen soon, the consequences would be devastating. Oil has become the world’s foremost energy resource. There is no ready substitute, and decades will be required to wean societies from it. Peak Oil could therefore constitute the greatest economic challenge since the dawn of the industrial revolution. How have the forecasts of the Peak Oil analysts held up so far? In the light of Peak Oil, what will be the consequences of current energy policies? Is the world developing new policies in response to the warnings in a way that will forestall dire consequences? If not, what should be done? 1. How are the forecasts holding up? While it is possible to find examples of warnings about the end of oil dating from the 1920s and even earlier, the scientific study of petroleum depletion begins with the work of geophysicist M. King Hubbert, who in 1956 forecast that US production would peak within a few years of 1970 (in fact, that was the exact peak year), and went on to predict that world production would peak close to the year 2000. For many years, no other serious analyst made the effort to collect and analyze the data needed to calculate when growth in the world’s oil flows might fall to zero. Shortly after Hubbert’s death in 1989, however, a few other scientists began to come forward with their own forecasts. Are events unfolding in such a way as to support the near-peak or the far-peak forecasts? If we define oil narrowly, then Deffeyes’s forecast for a peak in 2005 may already be confirmed. 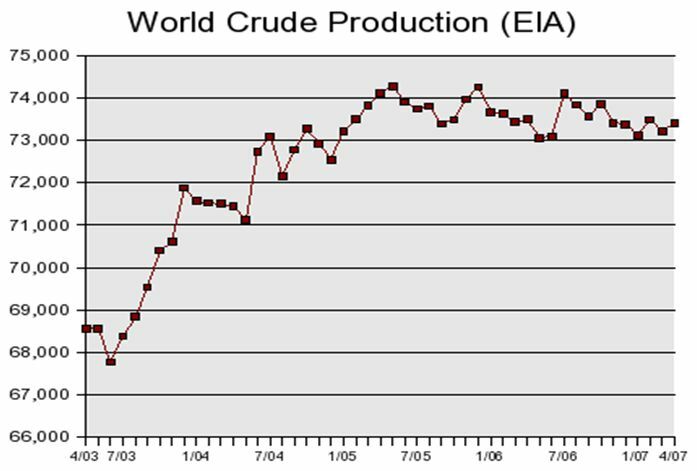 According to the Energy Information Administration (EIA), a division of the US Department of Energy, the monthly average for daily world production rates for crude oil achieved 74.2 Mb/d in May 2005; that figure has not been equaled since. The last month for which totals have been published is April 2007, which saw average daily production of about 73.4 Mb/d. This by itself is an extraordinarily suggestive piece of information: the past two years have seen sustained high prices for oil, a situation that should provide a powerful incentive to increase production wherever possible. However, evidence presented below suggests that, on the whole, ramping up production may not be possible. If oil is defined more loosely, the situation is similar, though the decline is less severe. 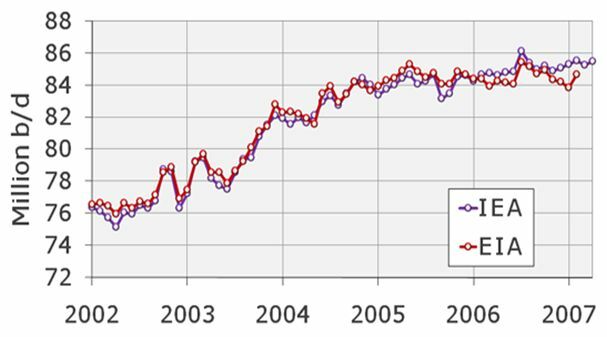 Production rates for “all liquids” (a category that includes natural gas liquids and condensates, synthetic oil from tar sands, refinery gains, and biofuels) have been more or less static during the same period: according to the EIA, the twelve-month monthly average for daily production of “all liquids” reached a peak in February 2006 at 84.578 Mb/d; for April 2007, the equivalent figure was 84.474 Mb/d, indicating essentially flat production rates for the past 14 months. North Sea (Great Britain, Norway, and Denmark, collectively producing 4,343,000 b/d): production is declining rapidly; Britain is or will soon be a net oil importer. Meanwhile, the most obvious confirmation of problems with the global oil supply is the fact that prices have soared from $12 a barrel in 1998 to over $75 today. Many of the places where it is technically possible to increase production are politically unstable or unfriendly to some importing nations; others are geographically remote—in polar regions or ultra-deep water—presenting the oil industry with unprecedented technical challenges. There is currently a global shortage of drilling rigs, and the cost of renting them is skyrocketing. More rigs are being built, but this takes time. The industry has been shedding trained and experienced geologists and engineers for the past two decades; most of those who remain are nearing retirement age. The resulting shortfall in skilled labor could lead to an increase in delays and problems on new oil and gas projects. Thus even if below-ground constraints to the current global supply of oil can potentially be temporarily overcome with new production from countries like Iraq or from new oilfields in ultra-deep water, above-ground factors like the ones cited here may conspire to keep that new production from appearing fast enough or in sufficient quantity. New production, when it finally does come on-stream, must meet new demand while offsetting accumulating and accelerating declines from existing fields—so delays make the latter problem much harder to solve. In sum, it will be impossible to say with certainty that global oil production has peaked until several years after the fact. But taking all of the above factors into account, the notion that it may already have reached its effective maximum cannot be dismissed, and therefore must be taken very seriously by policy makers. 2. What might happen in the next decades absent policies to address Peak Oil? The likely consequences of Peak Oil have been analyzed and discussed at some length in the report, “Peaking of World Oil Production: Impacts, Mitigation, and Risk Management,” commissioned for the US Department of Energy and published in 2005 (the Hirsch Report).16 That report forecast “unprecedented” social, economic, and political impacts if efforts are not undertaken, at a “crash program” scale, and beginning at least a decade in advance of the peak, to reduce demand for oil and initiate the large-scale production of alternative fuels. Clearly, the level of impact will depend partly on factors that can be influenced by policy. One factor that may not be susceptible to policy influence is the rapidity of the post-peak rate of decline in global oil production. The Hirsch Report simply assumed a two percent per year decline. In the first few years after peak, the actual decline may be smaller (we have in fact seen a one percent per year decline in crude oil production over the past two years). That rate of decline may increase to more than two percent per year or more within five years as declines from existing fields accumulate and accelerate, unless substantial new production sources can be found. However, for some nations the situation may be much worse, since available oil export capacity will almost certainly contract faster than total oil production. Every oil-exporting nation also consumes oil, and domestic demand is typically satisfied before oil is exported. Domestic oil demand is growing in most oil-producing nations; thus the net amount available for export is declining even in some countries with steady overall production. For example, Russia’s exports fell over the past year even though its total production of oil increased. Saudi Arabia provides another instance: according to the EIA, total Saudi production declined 3.4 percent in the two-year period from January 2005 through December 2006, and domestic consumption increased 5.8 percent; as a result, Saudi exports declined 5.3 percent. Obviously, nations that are major oil importers, such as the US, China, and many European nations, will feel strongly the effects of sharp declines in the amount of oil available on the export market. High prices and actual shortages will dramatically impact national economies in several important ways. The global transport system is almost entirely dependent on oil—not just private passenger automobiles, but trucks, ships, diesel locomotives, and the entire passenger and freight airline industry. High fuel prices will thus impact entire economies as travel becomes more expensive and manufacturers and retailers are forced to absorb higher transport costs. Conventional industrial agriculture is also overwhelmingly dependent on fossil fuels. Artificial ammonia-based nitrogenous fertilizers use natural gas as a raw material; modern farm machinery runs on petroleum products; and oil provides the feedstock for making cheap pesticides. According to one study, approximately ten calories of fossil fuel energy are needed to produce each calorie of food energy in modern industrial agriculture.17 With the global proliferation of the industrial-chemical agriculture system, the products of that system are now also traded globally, enabling regions to host human populations larger than local resources alone could support. Those systems of global distribution and trade also rely on oil. Within the US, the mean distance for food transport is now estimated at 1,546 miles.18 High fuel prices and fuel shortages will therefore translate to higher food prices and could even cause food shortages. A small but crucial portion of oil consumed globally goes into the making of plastics and chemicals. Some of the more common petrochemical building blocks of our industrial world are ethylene, propylene, and butadiene. Further processing of just these three chemicals produces products as common, diverse, and important as disinfectants, solvents, antifreezes, coolants, lubricants, heat transfer fluids, and of course plastics, which are used in everything from building construction materials to packaging, clothing, and toys. Future oil supply problems will affect the entire chain of industrial products that incorporate petrochemicals. Economic impacts to transport, trade, manufacturing, and agriculture will in turn lead to internal social tensions within importing countries. In exporting countries the increasing value of remaining oil reserves will exacerbate rivalries between political factions vying to control this source of wealth. Also, increased competition between consuming nations for control of export flows, and between importing nations and exporters over contracts and pipelines, may lead to international conflict. None of these impacts is likely to be transitory. 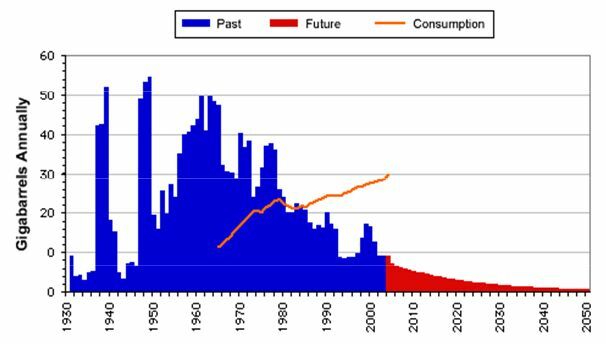 The crisis of Peak Oil will not be solved in days, weeks, or even years. Decades will be required to re-engineer modern economies to function with a perpetually declining supply of oil. 3. How is the world responding? Now that those assurances are wearing thin and the IEA has begun issuing warnings about the adequacy of future supplies, what are the prospects for substantial change in policy among the major Western governments? The four-year period extending from 2005 to 2009 has already seen—or will soon see—changes in leadership in several key nations. Might this be an opportunity for a new energy paradigm to take root on both sides of the Atlantic? The US will undergo a change of government next year, with a Democratic Party president and congressional majority likely to be in office by the end of January 2009. There are indications that this new leadership will pass laws to require improved auto fuel efficiency. However, absent a perceived crisis, it is likely that the scale of the effort will be modest: American automakers have opposed efficiency legislation for years, and autoworker unions (which heavily influence Democratic Party policies) have supported the automakers’ opposition. The Democrats will probably support the faster development of renewable energy, primarily by further enhancing subsidies to the production of corn-based ethanol. In the UK, at his first Prime Minister’s Questions, Gordon Brown (who assumed office in June 2007) said that Russia’s cutoff of gas supplies to Ukraine last year “should make it clear to everyone that we cannot rely on an energy policy that makes us wholly dependent on one or two countries or one or two regions around the world.”25 As a response to declining North Sea oil and gas production and increasing European dependence on energy supplies from Russia, Brown is committed to the expansion of nuclear power. Clearly, efforts to develop renewable sources of electricity are necessary to deal with Climate Change; however, unless these are undertaken in concert with an electrification of transport and agriculture, they will do little to address the Peak Oil crisis, since very little of the transport sector currently relies on electricity that could be supplied from solar, wind, or new nuclear plants. Biofuels are the subject of increasing controversy having to do with ecological problems, the displacement of food production, and low energy efficiency; even in the best instance, they are unlikely to offset more than a small percentage of current oil consumption. Thus, policies currently being contemplated by these nations, even with new leadership in place, are likely to be woefully inadequate to avert “unprecedented” impacts from declining global oil production. 4. What would be a sufficient response? In order to enlist public support for such efforts, governments would need to devote significant resources to public education campaigns. In addition, planning and substantial public investment would be needed in three critical areas: transportation, agriculture, and chemicals industries. While efforts along these lines require support at the national level, some local polices could be extremely helpful, including the promotion of farmers’ markets and community-supported agriculture; promotion of gardening, including community gardens, rooftop gardens, and school gardens; and the favoring of local and organic production over conventional food for school food programs and other purposes that are under the control or influence of government. Several large companies are already researching how to replace petrochemicalbased materials with renewable alternatives. This strategy is not without problems, however. To replace the entire stream of plastics and other oil-based materials in the world economy with crop-based materials would further strain agricultural systems already stressed by the increasing mandate to produce biofuels in addition to food. Moreover, many chemical processes that incorporate renewable feedstocks are energy-intensive, which means that the expansion of those processes would entail increased energy consumption. Oil depletion presents a unique set of vulnerabilities and risks. If policy makers fail to understand this, the resulting policies may leave nations mired both in internal economic turmoil and external conflict caused by fuel shortages, to the point that the pursuit of international climate policies becomes much more difficult than is already the case. Thus while policy makers may assume that, in addressing the dilemma of global Climate Change, they are also doing what is needed to deal with the problem of dependence on depleting petroleum, this could be a dangerously misleading assumption. On the other hand, if nations were to try to mitigate the economic impacts of oil depletion by producing large amounts of synthetic petroleum from coal and other low-grade hydrocarbons, the climatic effects could be catastrophic. Fossil fuels have delivered enormous economic benefits to modern societies, but we are now becoming aware of the burgeoning costs of our dependence on these fuels. The human community’s central task for the coming decades must be the undoing of its dependence on oil, coal, and natural gas in order to deal with the twin crises of resource depletion and climate chaos. It is surely fair to say that fossil fuel dependency constitutes a systemic problem of a kind and scale that no society has ever had to address before. If we are to deal with this challenge successfully, we must engage in systemic thinking that leads to sustained, bold action. 18. Pirog. R., and A. Benjamin, “Calculating food miles for a multiple ingredient food product.” Ames, Iowa: Leopold Center for Sustainable Agriculture, 2005.